Stress (or anxiety) is something that affects a lot of people all over the globe in countless ways. However, this time we are going to shift our focus towards those that are often overlooked. We are referring to those little balls of fur that make your lives fluffier and happier with every shared moment. Our cats can go through the ordeal consisting of stress and anxiety just as we have to suffer through them. You could say that they are having an even worse time since they can’t share what they are going through. But is it really the case? Give this article a thorough read and find out how you can spot cat anxiety symptoms in a heartbeat. First and foremost, we have to make sure we really understand the problem at hand. According to the people posting on PetMD, anxiety consists of anticipating future dangers that spawn from imaginary or unknown origins which results in body reactions that are natural responses to fear. The most common behaviors observed include urination, destruction and excessive crying. It seems that the type of anxiety encountered the most in our dear pets is represented by separation. Cat separation anxiety happens when the animal shows signs of extreme distress and erratic behaviors while left alone. Let’s continue to see how we can tell if our cat is anxious and if there are any cat anxiety meds we can use to help our pets live a happier life. There are numerous symptoms to mention when we speak about anxiety in our cats. Allow us to go through some of them in order to keep you as up to date as possible with all the information you require to take care of your beloved ball of fur. It is completely natural for cats to hide because some are more social while others are a little bit shy in nature. However, if you feel that your cat is hiding so much that you are beginning to feel like you don’t even have a cat anymore, then this could mean some serious issues that your beloved Fluffy has to go through. Another warning sign you should be on the lookout for is extra aggression for no apparent reason. 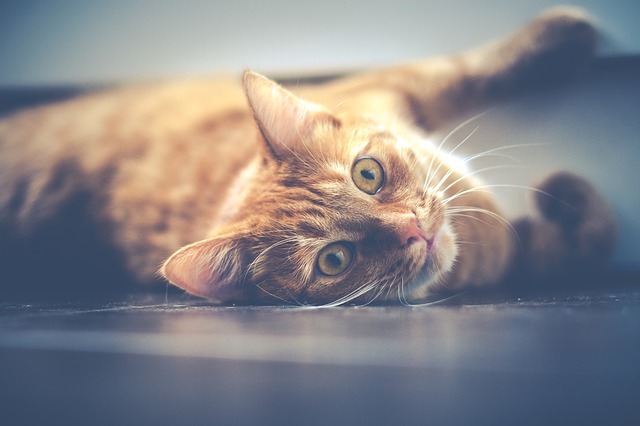 If you notice a sudden increase in your cat’s aggression levels and you can’t pinpoint a reason, your kitty might be trying to protect him or herself from anxiety. As you can probably guess, what was once a well-behaved pussycat doesn’t turn berserk on you suddenly and repeatedly without something serious being the underlying cause. That is exactly why you should be paying extra attention to your pet and try to fix any problem that you might discover. Another root cause of anxiety is boredom. You read that right. Although boredom might be more associated with a feeling of laziness and relaxation, it can result in anxiety. That’s because this is an animal that craves attention and if you don’t ‘feed’ it to him or her, then your beloved belongings are going to pay for your mistakes. There is a trend in our popular culture stating that cats meow in order to communicate with their slaves/masters. If you notice that your ordinarily quiet feline companion starts to get your attention with what seems to be excessive meowing, you might be left guessing at what is it they’re trying to say. In fact, they might be sharing the fact that they are feeling a little bit down and gloomy. A sudden increase in chattiness simply means that they have something to let you know and especially if you notice a kind of vocalization that seems to be quite troubled, it might just be a form of a distress call. When they do that, help them immediately! Perhaps you are reading this article because you already found out that your cat is going through anxiety and all you desire right now from your beloved gods is to bestow a sudden relief for your purry couch opponent (because Fuzzball just loves to steal your seat). In other words, you might be here to find some kind of cat anxiety treatment. Good for you, you care. Let’s start out with the obvious: cat anxiety medication. The internet seems to be filled to the brim with all kinds of products which you can allegedly use to alleviate the symptoms. When our current society is still dealing with stuff like deciding on the usefulness for vaccines (don’t worry, we won’t take a side in a cat-related article), you can probably imagine that there are people who are for and against using anti-anxiety medication for cats. What is extremely important to know (and this advice you should apply, human) is that you should always use medication only after and if it has been prescribed by a scholar of medicine, in this case, the veterinary type. So, even if the internet practically begs you to let it transform your cat into an upgraded version, check with your trustworthy vet first if those anti-anxiety meds for cats don’t have some nasty side-effects. Because humans worshiped cats for many centuries, it should be no surprise that we are constantly innovating our ways to make their lives better. The latest item from this collection comes in the form of a cat anxiety vest. This item will first increase the cuteness of your cat, and then it will start healing its possessor. It seems to be safe to use since it uses pressure applied constantly and gently. It is convenient since you won’t have to train your cat and it seems to have an 80% success rate, so you might want to give it a go. Our dear cat-patriots, we are here to declare that there is hope! If your cat seems to be caught in the shackles of kitty despair, you CAN do something about it. All jokes aside, pay attention to your cat, notice if there’s anything going wrong, ask for your vet’s advice and – we can’t stress this enough – don’t judge your cat for his or her actions. If you enjoyed this post, maybe you’d like to check out one of the first ones I ever published on the blog – several tips on how you can keep your cat off your furniture.